I recently took this beautiful picture of a sunset of Sebago Lake from the side of the road; through a chain-link fence with my iPhone. I enlarged and framed it. When I showed it to my son's friend, a photography major, he actually said, "makes me wonder why I spend all kinds of money on cameras and camera equipment." It's crazy to think our smartphones can often take as good if not better photographs than our traditional DSLR cameras. Technology has come so far so fast! I have a photographer friend who has many photographs that have been featured on some high profile photography sites and she tells me that many were shot using her smart phone! I'm amazed! Below are some resources on how to use your smart phone camera more effectively. This a series of 20 videos created by Carl Hartman, a professional photographer who was editor and executive producer at Universal Studios and PBS. His videos are extremely informative both with general photography basics as well as how to get the effects using your smart phone. He shares information for add-on apps as well, some FREE and some at a pretty low cost. If you want to give it a try...I encourage you to take a look at his photos! They are pretty amazing...all from his smartphone! If you own an iPhone 4, 4s or 5 then you need to check out the World’s first iPhone Video training program. Former MTV and BBC TV Director Jules Watkins has created a video based course that will show you how to make awesome videos using your iPhone. Jules has directed hit TV shows including The Biggest Loser and Pimp My Ride and knows a thing or two about how to make videos that attract a following. The videos he has made on his iPhone for this training will stun you! 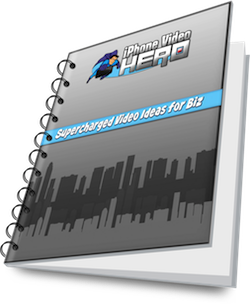 If you are an entrepreneur, biz owner or just want to make better videos with your iPhone then you need to watch Jules’ video at iPhone Video Hero. ***Here is a list of helpful photo apps researched on TechRadar.com that you can explore to help you with your photo editing. You can also find apps to help you print and share your favorite photos by visiting: Must Have Apps!